Biology Professor David S. Hibbett has been named a Fellow of the American Association for the Advancement of Science (AAAS) and is included on the Highly Cited Researchers 2018 list from Clarivate Analytics. Both honors were bestowed on him by his peers. This year, the AAAS recognized 416 of its members with an elected lifetime Fellowship in honor of their scientifically or socially distinguished efforts to advance science or its applications. Hibbett is the seventh Clark faculty member to be named an AAAS Fellow since 1958. The last Clark scholar to receive this honor was Provost and Vice President for Academic Affairs Davis Baird in 2010. The Highly Cited Researchers list identifies scientists and social scientists who have demonstrated significant influence through publication of multiple highly cited papers during the last decade. Researchers are selected for their exceptional performance in one or more of 21 fields (those used in Clarivate Analytics’ Essential Science Indicators) or across several fields. Hibbett is among 2,000 researchers recognized as having exceptional cross-field performance. Hibbett, who has been at Clark since 1999, is considered one of today’s leading researchers in the analysis of fungal relationships through DNA analysis. He concentrates his lab work in evolutionary biology and ecology of fungi. He is a Fellow and past president of the Mycological Society of America, and served as a Grass Fellow at the Radcliffe Institute for Advanced Study at Harvard University. 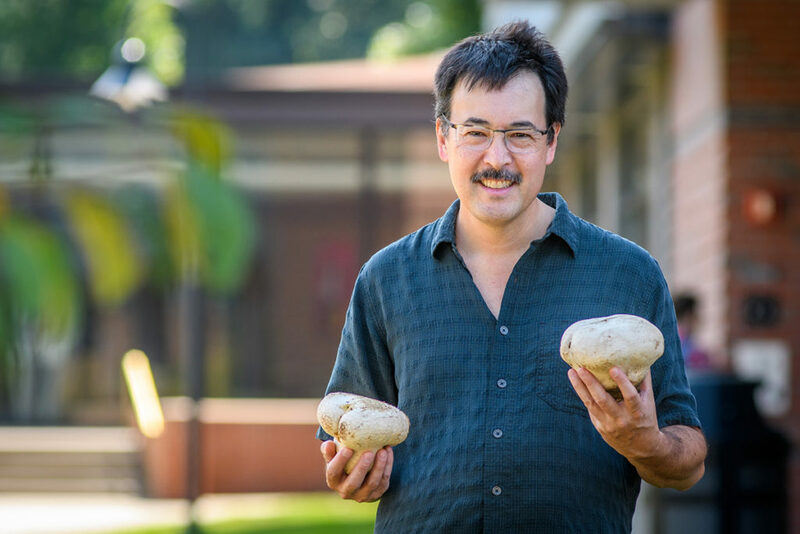 He recently collaborated with the Worcester EcoTarium to create a permanent “Fungal Tree of Life” exhibit (which includes artwork by Clark alumna Amy Yeager ’17) and is working on a book on mushroom evolution for a general audience. For more about the Hibbett Lab, visit his blog. The new AAAS Fellows will be formally announced in the Nov. 29 issue of the journal Science. They will be presented with their official honors during the February 2019 AAAS Annual Meeting in Washington, D.C. The American Association for the Advancement of Science is the world’s largest general scientific society. It publishes the journal Science as well as Science Translational Medicine; Science Signaling; a digital, open-access journal, Science Advances; Science Immunology; and Science Robotics. AAAS was founded in 1848 and includes nearly 250 affiliated societies and academies of science, serving 10 million individuals. The nonprofit is open to all and fulfills its mission to “advance science and serve society” through initiatives in science policy, international programs, science education, public engagement, and more. Highly Cited Researchers from Clarivate Analytics is an annual list recognizing influential researchers in the sciences and social sciences from around the world. The list focuses on contemporary research achievement; only highly cited papers in science and social sciences journals indexed in the Web of Science Core Collection during the 11-year period 2006-2016 were surveyed. Find out more about the methodology here.